Crowds listen to Grantsville Mayor Brent Marshall speak about the new library Saturday for the ribbon cutting. The library has been unofficially opened since March 29, and several people made their first visits to the library during the ribbon cutting ceremony. Tooele Mayor Patrick Dunlavy and Grantsville Mayor Brent Marshall (center) chat while they hold on to the big scissors at the Grantsville Library ribbon cutting Saturday. It may not have ended any global wars, but the Grantsville City Public Library has found itself designated as a sort of monument to peace. 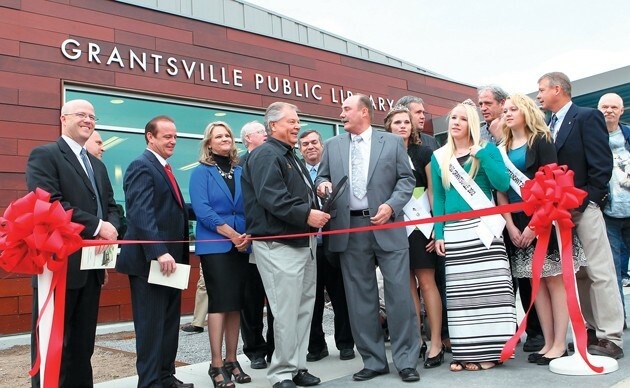 Speaking to scores of people crowded inside the building at a ribbon-cutting ceremony Saturday morning, Grantsville City Mayor Brent Marshall reflected on the progress to construct the library, and what it took to make it happen. Marshall said a little more than two years ago, he and the Grantsville City Council met on a cold, dark night with Tooele City Mayor Patrick Dunlavy and the Tooele City Council to hammer out a settlement over a decade-long lawsuit. 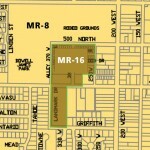 Tooele, Grantsville and Stockton had locked horns over the privatization of then Utah Industrial Depot (now called Ninigret). 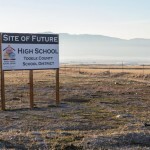 Tooele was accused of keeping $15 million from the 1999 sale of UID instead of using it to benefit the whole county. “We sat down and talked,” said Marshall. “We’d had more caucus meetings than the Republican Party. But we did come to an agreement.” The mayor noted he hoped such long-standing acrimony would never return. “This building is a tribute to that agreement,” he said. Dunlavy said he agreed with Marshall’s wishes that only cooperation and friendship would be fostered between the two communities in the future. Also reflecting on that night the two municipalities reached an agreement, Dunlavy said the suggestion of the settlement in the form of a library for Grantsville was something that had never before been suggested. It gave them pause. Dunlavy and Marshall both inherited the lawsuit from prior administrations, and about $2.5 million had been spent on legal costs between the cities — an amount that, ironically, became the budget for the new library. As the ribbon-cutting program progressed, many of the children present found their way into reading areas and looked through books. Because of blustery winds and a gray sky overhead, much of the program was indoors, except for the ribbon-cutting itself. Once the ribbon was snipped outside the shiny new building, the library was open for regular business. 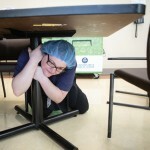 Although it has been unofficially opened since March 29, this was the first time many patrons had been inside, including 14-year-old Abbie Hamner. She was found curled up with a book by the library’s fireplace. For Jaylene Hajek, having a local source for books again is especially welcome after the Tooele County Bookmobile Library stopped service last October. When they got the word that the bookmobile was going to close, Hajek said, her 4-year-old son, Nathan, was devastated by the news. Grantsville City Public Library Director John Ingersoll said the inherent difficulties of starting a facility like a library from the ground up were lessened by generous support from the community. Residents pitched in more than 600 volunteer hours in the weeks before the library opened to catalogue books and place the volumes on shelves. Library cards are free to city residents with proof of residency, $10 for outside patrons and $5 for outside patrons age 55 or older. The fee is waived entirely for students who live outside city limits but attend schools in Grantsville. Library hours are currently 2 p.m. to 7 p.m. Tuesday through Friday and 10 a.m. to 2 p.m. on Saturdays.